Cats destroying furniture: How can I stop them? Posted on December 15, 2018 by Dr. Dale Rubenstein. Cats destroying furniture. It’s a common complaint. But think of this from your cat’s point of view, and you might find some reasonable solutions. Jewelry Diamond and Shine Coin are beautiful grey/white little girls, about 8 months old now. Their owners were at their wits end about how much damage the kitties were doing to their furniture, and they weren’t too happy to have kittens on the counters in the kitchen, either. As a last resort, the cats were banished to the basement. The room is large and has windows, but the cats were away from the family, and the owner’s young daughters sort of forgot about the cats. Here are some recommendations I gave to the owners to help the kittens become part of the family again. I hope they might help you with your own cats. The main issue with cats is having acceptable alternatives. So if they like high places, we need to offer them high places – but that doesn’t have to be on top of an expensive piece of furniture. One option is a higher cat tree by a window. For cats, the ideal height of a cat tree is about 8′, but most of ours stop at about 4′. Wall shelves are another option. Dr. Mustillo and her husband installed 4-6″ shelving along the wall. They covered the wood so the cats won’t slip and won’t get splinters. This gave their cats a high place to walk around the room that did not take up additional floor space in their living room. 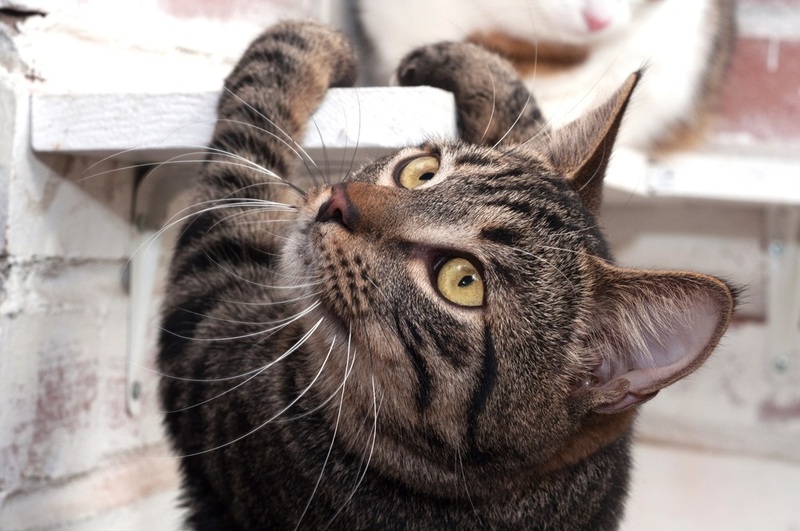 Dr. Mustillo recommends making sure there is a way the cats can enter and exit the shelves, because sometimes her kitties fight over who can leave first. They covered the shelves with carpet tiles so they are non-slip, Dr. Mustillo put beds on the upper/corner shelves (you can see JoJo, Lilly and Tater Tot in photo above). 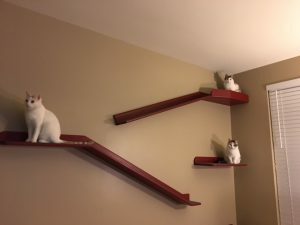 Her husband reinforced the shelves with extra screws so as the cats got heavier (became adults), the shelves were sturdy enough to hold them. You can buy shelves online, but they are not that difficult to make, and they would be much less expensive. Never leave food out on the counter, as it will just encourage your cats to jump up—and then they receive a reward (food!) for doing so. Double-sided sticky tape (for example, “Sticky Paws”, which you can find at a larger pet store or online) will help discourage them. There is also something called SSSCat that has a motion sensor and shoots a blast of air to startle them. Of course, you have to remember that it’s there so you don’t scare yourself! Chicken wire (can purchase at hardware or farm store) on counters, or aluminum foil to cover counters may also work. Again, always offer an acceptable alternative high place. I have 5 cat trees on 4 levels for 2 cats in my home, including cat trees in both the kitchen and living room on main level, since our cats want to be wherever we are. Each time they do jump up on the counter, you move them to the cat tree and have catnip or some other reward there. The tree becomes a reward, and the counter does not. I would recommend a heavy rug with rubber backing to protect the furniture you don’t want them on, while offering things like above that are OK. You might also put something like chicken wire on top of the rug. This way, if they do jump up, they figure this is not a place they want to be. Blue painter’s tape can be safely applied to the legs of furniture, and you can then put Sticky Paws on that. You should also have an acceptable scratching post nearby. I have a flat cardboard scratcher in the living room, as well as one on all the cat trees. When they are scratching something they shouldn’t, such as your furniture legs, the sticky tape will act as a deterrent. But you also should move them to what is acceptable. Patience and persistence is key! It takes repetition, but after a few months, they will figure out what is OK and what isn’t. I spent a lot of time doing this when the kittens were young, and some things I found out along the way. But, I truly don’t have a problem with their scratching or jumping on kitchen counters or table now. For Christmas this year, maybe Santa will bring your cats some nice places to climb! Your cats (and your furniture) will be so happy if he does!